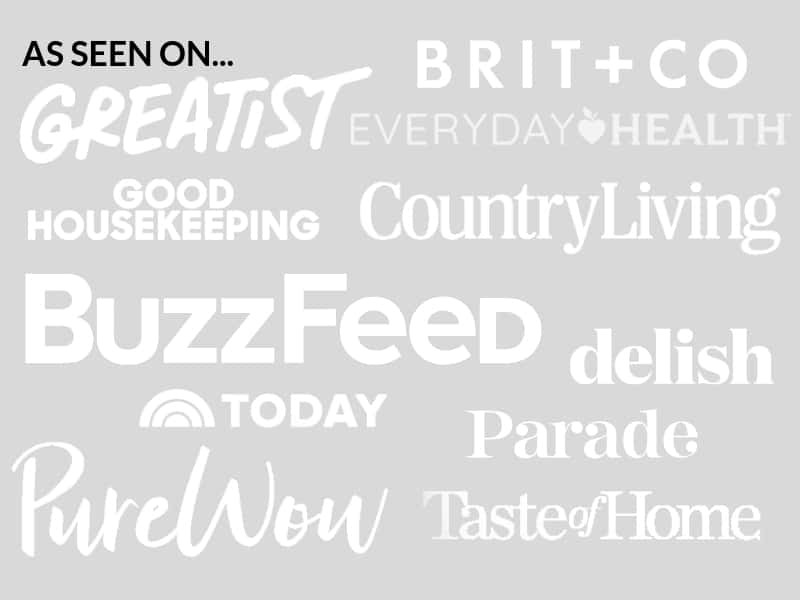 December 6, 2017 By Elizabeth Lindemann 10 Comments / This post may contain affiliate links. I don’t always post desserts on my blog (since I try to keep things as fresh and low sugar as possible), but when I do… I make sure it’s good. 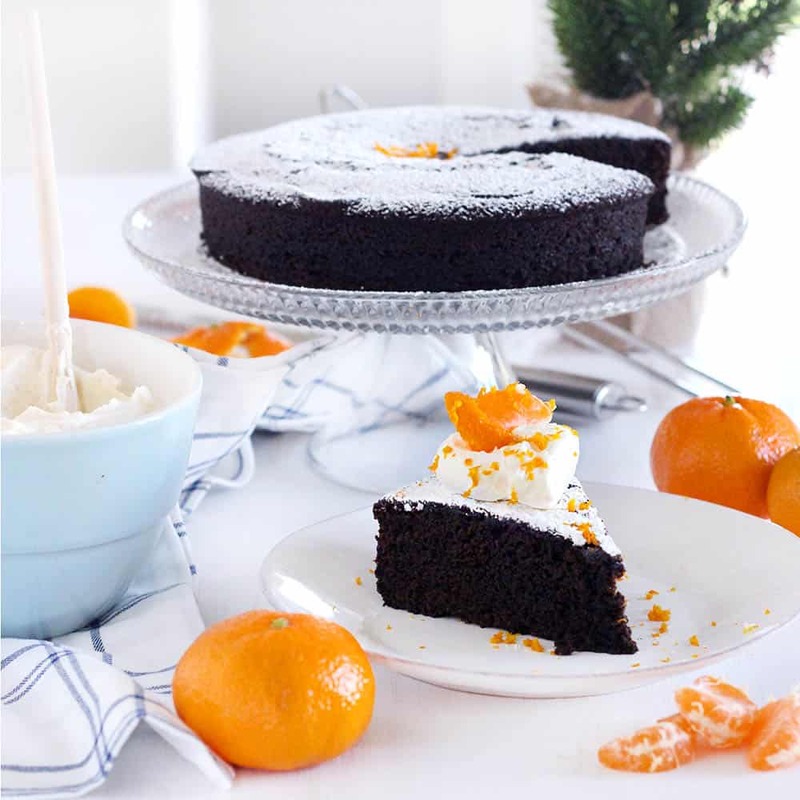 And this Spicy Gingerbread Cake with Orange Mascarpone Cream doesn’t disappoint! This is the PERFECT holiday dessert. Best of all: it’s mostly sweetened with molasses (which, fun fact, is an awesome source of calcium, iron, and magnesium) instead of refined sugar. The cake is not too sweet, and it’s full of all the delicious holiday spices you love, including both ground AND fresh ginger. And the orange mascarpone cream is fluffy, light, and divine- the fresh orange flavor pairs perfectly with the gingerbread cake. In the spring, we planted a satsuma orange tree in our back yard. It’s thrived this year, and has produced upwards of 20 oranges. That’s tons, for such a new, itty-bitty tree! Satsumas are one of the most popular kind of Mandarin oranges, and are known for how juicy they are. Which makes them perfect for cooking. I used satsuma zest and juice in the whipped cream, but you can use any kind of orange you want – Mandarin or otherwise – to make it. Ever since seeing Stress Baking’s Mascarpone Whipped Cream recipe, I’ve been aching to try it out. I just LOVE mascarpone cheese. Usually found in Italian desserts like tiramisu or cannoli, it’s a very soft and somewhat sweet cheese that’s creamy, decadent, and delicious. In this recipe, it thickens the whipped cream a bit and adds a smooth, velvety flavor and texture to the mix. 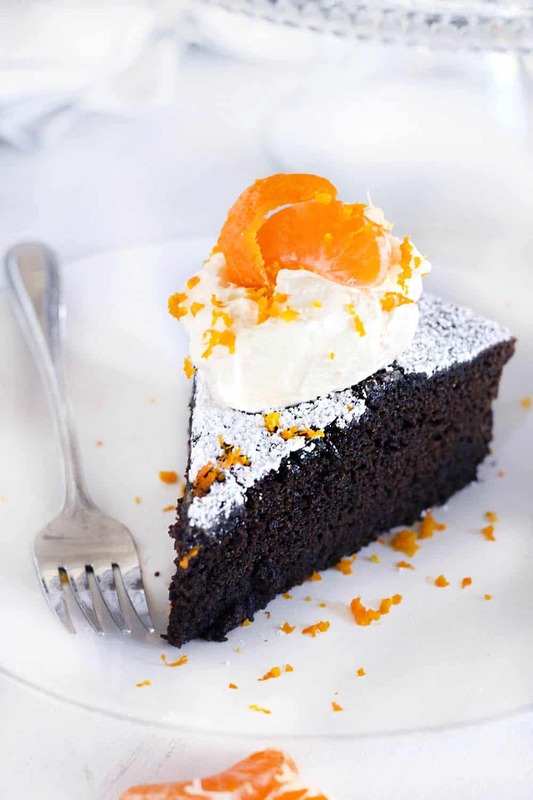 It’s simple and lets the fresh orange shine, and it compliments the spices in the cake perfectly. As with the cake, the orange mascarpone whipped cream isn’t too sweet and only has 1/4 cup of sugar in the whole batch. Which means you can definitely, without a doubt, eat it by the spoonful while you are waiting patiently for the cake to bake. Right? The cake really is just a traditional recipe for fresh gingerbread, but since I made it in a round pan and served it like a cake, I called it a cake. It’s best served warm in all its gooey, sticky, molassesey glory, topped with the cool whipped cream. I love using fresh ginger in desserts (like in these spicy ginger date cookies)– for this cake, I used both fresh AND ground to add an awesome, spicy, gingery punch. The orange mascarpone whipped cream can be made a few days in advance. The cake can be made a day in advance, but since it’s best served warm, I recommend reheating the slices in the microwave for a few seconds just before serving. Alternatively, since the cake takes a good hour to bake, it would be easy to throw it in the oven during your holiday dinner. By the time everyone is done eating and has digested a bit, it will be ready to go! 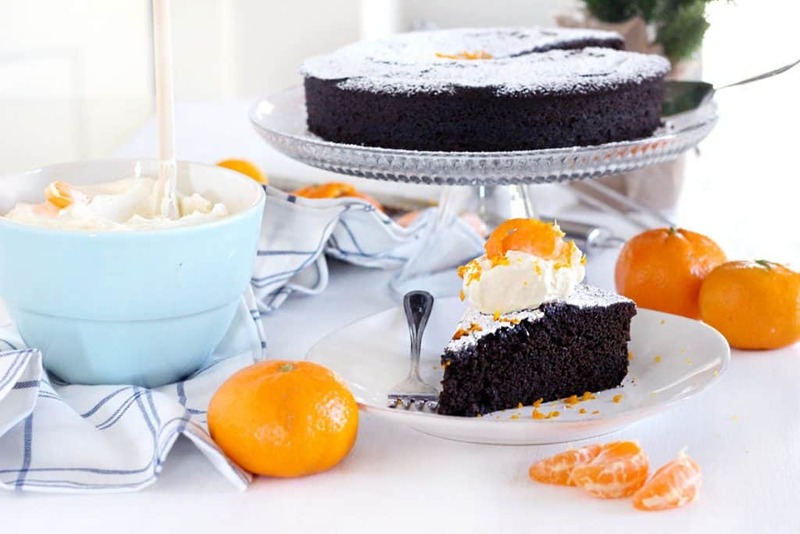 Here’s the recipe for Spicy Gingerbread Cake with Orange Mascarpone Cream. Here’s to holiday baking! 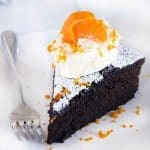 This spicy gingerbread cake with orange mascarpone cream is packed with fresh ginger flavor and all the holiday spices you love! It's not too sweet and has very little refined sugar, and pairs perfectly with the light, fluffy whipped cream made with mascarpone cheese and fresh orange zest and juice. It's the perfect holiday dessert! Grease the sides and bottom of an 8 or 9 inch round pan generously with butter, then line the bottom with parchment paper (I traced the pan with a pencil and cut slightly inside the line). In a large mixing bowl or standing mixer, cream together the butter and sugar. Add the egg and mix on high until fluffy, about 2 minutes. Add the molasses, fresh ginger, ground ginger, cinnamon, cloves, salt, baking powder, and baking soda. Mix thoroughly. Add the flour and mix at a low speed until fully combined. Add the warm water and mix until combined, then increase the speed to high and beat for one more minute. Pour into prepared greased and lined pan. Bake at 325 degrees F for 55 minutes, or until toothpick inserted in center comes out clean. Allow to cool in pan for at least 10 minutes, then flip upside down to remove from pan. Discard parchment paper. Dust top of cake with confectioner's sugar and garnish with orange zest, if desired. Meanwhile, to make the orange mascarpone cream, mix the mascarpone cheese, orange zest, orange juice, and sugar thoroughly. Add the heavy cream and mix on high until stiff peaks form. 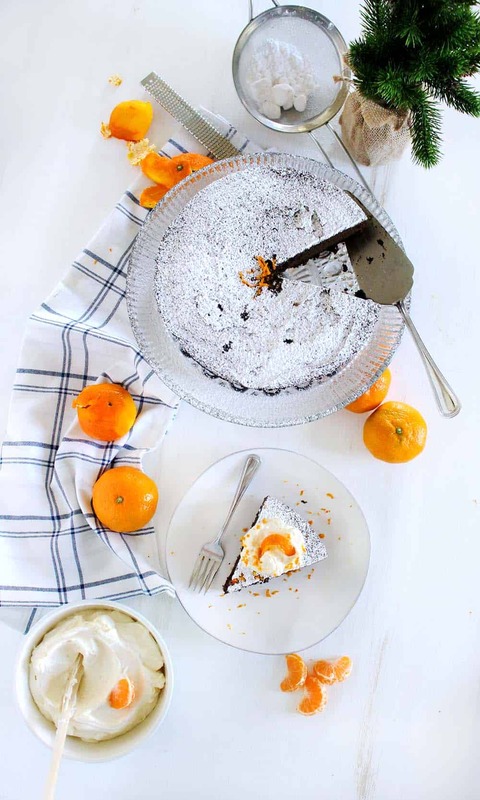 Serve the cake warm, topped with the orange mascarpone cream and extra orange zest. Hiiii!!! I was thinking of baking this in a bundt pan. Obviously I wont be able to use parchment paper… what are your thoughts?? Would it slide out without using parchment paper?? Can this be made without the fresh ginger? If so, how much ground ginger? Do I just swap the fresh for ground? This looks fantastic and can’t wait to try it. Yes, you can make it without fresh ginger! I find it tastes a bit different- more zingy and spicy with fresh ginger- but dried will work :-) Since you use both in this recipe, just add some more dried- I’d probably do 1 teaspoon dried to replace the 1 tablespoon fresh (for a total of 1 tablespoon plus 1 teaspoon). If you like things really gingery, you could add a bit more. Hope that helps, and hope you like it! Craving dark gingerbread. This is perfect, not too sweet, and sooo good!